Testimonial just in from the lovely Chloe before she heads to Oz to set up home with the love of her life. 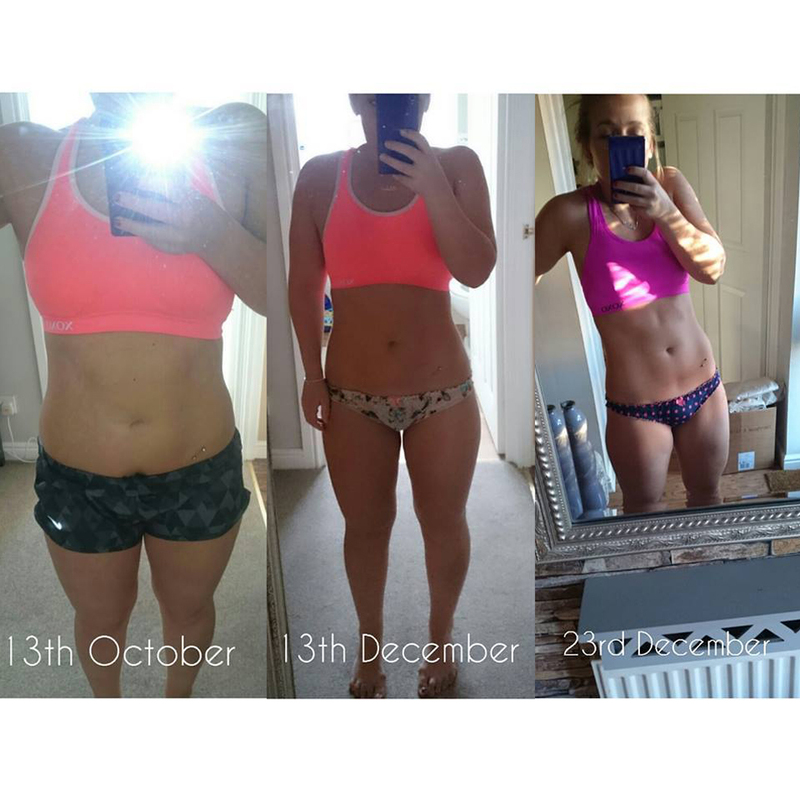 Chloe has been determined in the last 12 weeks to get in awesome shape for her latest adventure and we think she’s done a pretty damn good job!!! Chloe you have been an absolute pleasure from start to finish and we wish you the very best of luck with your new life… stay solid. “Hiya my name is Chloe and I am 21. I joined RT Fitness back in June and started Team Carnage with a good friend of mine. Daniel (Captain Carnage) was our coach, and we had so much fun!!! I mean the workouts were brutal at first but they get better… I’m not going to say easier though… you just get fitter and that’s when it becomes more enjoyable!!! Soon after we began, we both really started to see some results. After three months we both decided to have a bit time off for holidays etc; I went to Germany and constantly drank beer and ate whatever I wanted… doing no exercise whatsoever. I began to feel disgusting again after all of that hard work and it did set me back to almost what I was like when I started. When we came back we decided to move on to Warrior Women with a little encouragement from Sarah telling us about where we were at and the benefits we would achieve (I had a deadline to meet and wanted to up my game). Our coaches on Warrior Women are Ross & Sarah. The first day we got measured and weighed I had almost gone back up to where I’d started which made me so much more determined to get it off but this time, keep it off! Warriors has really changed me and has totally put a focus on what I want, which is to keep improving. Yes it’s hard… but like I said about Team Carnage you get better at it. And a hell of a lot stronger… There’s always going to be something you struggle with but you have to keep at it and you gain the strength. Sarah and Ross really try and get on your backs with nutrition so you can see yourself transform to the best you can. Nutrition hasn’t been brilliant consistently for myself, I’m 21 and it has been a big build up to Christmas and my leaving the country, but lifting weights has still shaped and toned me in all of the right places. I just think now though what would I have been like if I got the nutritional side of things spot on too or if I hadn’t had the binge break in the middle! So I am leaving the country like I mentioned, I’m moving to Australia and I literally can’t wait, but I am also thinking what am I going to do without these guys at RT Fitness! I feel so comfortable in myself now thanks to this lot and can’t wait to get myself into a bikini. It’s a constant journey and I will definitely join somewhere that’s hopefully similar to this place as I couldn’t have progressed the way I have without joining RT Fitness. I have had a blast and I love every single one of you!! Fitness doesn’t have to be boring!! I’m addicted to it and I will keep going! !